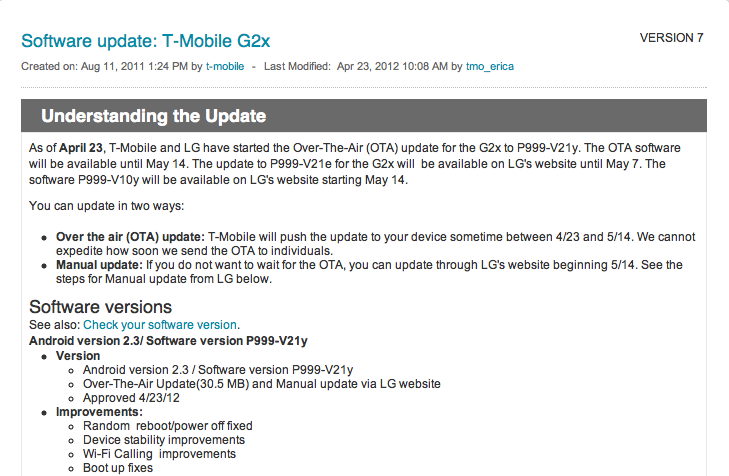 Update: The OTA update will continue through May 14th, users wishing to download without waiting for the OTA can hit the list of instructions on LG’s support forums to start the update right away. After an earlier version of the update was accidentally sent out via LG’s website, the update was pulled, added back and then pulled again it’s now completely official thanks to a post on T-Mobile’s support forums. Beginning today, April 23, T-Mobile and LG have started to send out an Over-The-Air update to the T-Mobile G2x labeled as P999-V21y. The OTA update will continue through May 14th, users wishing to download without waiting for the OTA can hit the list of instructions on T-Mobile’s support forums to start the update right away. After a couple of false-starts, we hope that G2x owners enjoy the update — even if it isn’t Ice Cream Sandwich. A year too late there LG. 50 years too late (yes I’m over exaggerating which is a huge understatement), I sold my G2x months ago. After a bit over 3 months, & 4 replacements & no promise of a alternate exchange & the Gingerbread update I received at the time failing, I sold it. Never again. I was so confident about the G line too, especially after previously having the HTC G2. Such an unfortunate event. Only 8 months behind the Sensation! I see the demand for these going up on craigslist/ebay soon if these fixes are any good. so if my phone says LG-P999-V21e I have to do it manually? No OTA update? Same here, I wonder how T-Mobile is going to screw us. no I have to wait until May 14th. Not sure what you guys are reading. If you already have version V21e, you should get an OTA update between now and May 14. If you haven’t gotten the OTA update by May 14, you can manually update starting on that date. Anyone whose phone is still on Froyo that wants to update to 2.3, can only do so manually until May 7. So, version V21e will only be available on the LG website until May 7. I think that’s where you guys are getting confused. the y version is the update, which is version 2.3.4. The version before that is V21e, which is 2.3.3. If you have V21e, you will get the OTA update. If you have the version before V21e, you will not get the OTA, but can only update to V21e using the LG support tool up until May 7. After that, version V21e will no longer be available. Where in there was I wrong? Yeah wow…why even wasted their time at this point. Worthless. Wow, maybe they’re re-release Froyo next. They’re doing a “great” job! We should always have OEMs do OS upgrades because they guarantee it’s “fully-baked”. Carbonite even! Hmm finally got rid of my G2x was tired of all the issues and now they come out with a update to fix them. I have had my Samsung galaxy S2 for a couple months and no issues. Loving it sorry LG should of been quicker. it’s like they have been holding a good doo doo for 8 months, and then let it loose. I ain’t buying nothing else LG. for one, I can not afford another phone so I have to deal with my G2X. im happy an update is out. the LG update tool still says 2.3.3 is the latest version. I tried the Update. It said mine had the latest version. I know for sure it does not. I have 2.3.3 not 2.3.4. I re downloaded the driver and tool and it still says that I am up to date. They need to update the tool. If you read the notice carefully, you cannot manually update until May 14. From now until May 14, the updates will be provided OTA. It’ll make a great spare phone when I replace it with the GSIII. My lame would squash your deal any day of the week……dig it? I rooted my G2X with SuperOneClick about 9 months ago and installed this update and now I cannot make or recieve calls…… All I have is an extremely loud buzzing and clicking noise when I try to answer to make a call. Everything else seems to be working fine, txt, web etc. WTF? Figured it out. All I did was go here http://rootzwiki.com/topic/23219-rom-stock-rooted-v21y-234-grj22-update/ and flash his rom! WORKS GREAT NOW! “The update to P999-V21e for the G2x will be available on LG’s website until May 7″…But the LG support tool says “phone has latest version”…Will I have to wait for an OTA? I just a few moments ago received the OTA update to V21y. It went smoothly, was installed, then rebooted in about 10 minutes. I don’t notice much change other than slightly quicker shutdown and reboot times – I did that a couple time just to check. All is well. I know this is a bit off topic, but I FINALLY got my OTA update for my myTouch 4G. Only almost a year late, T-Mobile. I won’t diss LG too much especially since I’ve moved on to some crazy rooting and ICS on my G2x baby, but this is hilarious. However some people don’t even have this update yet. Yes!!! Finally a major upgrade!!! Oh wait. It’s not. Thanks LG…looks like you guys are putting a lot of work into this phone. So thankful for rooted ICS roms. Yeah, those rooted ICS roms that won’t maintain data connections or switch smoothly from wifi to data. They don’t have hardware video acceleration so good luck with any video record or playback. People amaze me. They are willing to sacrifice what has become basic functionality in a smart phone just to be able to say they have the latest version of a piece of software. I’m not knocking the work the rom guys do, but it’s ridiculous to come in here and act like LG releasing an update for this phone isn’t a plus because you can root to the latest Android version. Rooting isn’t the miraculous cure all. I agree. After using the latest cynagenmod 7 and experiencing daily reboots and freezes I tried the latest ICS mods. Lots of lag issues and problems with the wifi calling app. I figured I would try the new LG Update. I can say it has completely fixed all issues for me. The phone runs super fast and has not froze or reboot in 48 hours. The 2.3.3 LG software was horrible, slow and constantly froze. The new version seems to have been the update I have needed for the past 10 months. I agree I got it in May 2011 the update was released soon after and I’ve never had a problem sense. However now with this new update I’m a little nervous about downloading it. I’m still using my G2x. Enjoying ICS via XDA but until LG releases all the drivers needed to get the complete experience of ICS, this phone is being mothballed once the SGIII hits. Just got it, the V21y software. I was hoping for ICS when the message popped up, “T-Mobile has an update” but this will do for now. I really haven’t had much trouble with my G3x. It’s been a great phone in the year I”ve been using it. I’ll keep using it with Gingerbread until it’s time for a new phone or until I get ICS from T-Mo & LG. I’ll play with the software on my other phones. Does this update break the native hot spot tether? How can I permanently turn off noise reduction on my samsung galaxy s2? I just received my OTA update this morning. Update took about 15-20 minutes or so. From what I can tell so far, it works much better and faster. Menus are snappier. Won’t be able to assess the random reboot/lock up issues until I’ve had it on for a few days, but so far so good. If this at least stabilizes the phone from here on out, it’ll finally be the device that I paid for. I can understand why people are pissed, but at least I hung in there until they got most of the bugs fixed. ICS would be nice eventually, but not a deal breaker for me. I just want a reliable phone that does everything I need it to do. I got the update on Saturday and it does indeed seem to be more stable. So far so good. This software update fried my phone and T-mobile is now making me pay for a new phone. They told me it is an LG problem, not theirs and are not responsible. So who is? I was forced to accept an update from T-Mobile, through LG, and now I do not have a working phone. I had to get a loaner, wait 3 days for T-Mobile to send me a new phone, AND pay for it. I am under contract with them and completely stuck. this update fried my phone as well! Now when I cut it in it just flashes from a light black screen to a dark black screen omg this is so annoying!!! I got the OTA update this morning at 7 AM. its currently 9 AM and its still trying to update. is there an expected elapsed time that I should know about before I can use my phone again?